Melechesh (1993-present) is a Black Metal band from Assyrian Nation. ormed in Jerusalem in 1993, by 1995 Melechesh launched their first demo including the As Jerusalem Burns track. The debut was well received, especially by the local authorities who gave them legal hassles over alleged "dark cult" activities in the holy cities of Jerusalem and Bethlehem, but after a few years the misunderstanding was cleared. In 1996 Melechesh released a 7"EP single entitled The Siege Of Lachish through the German label 'Membrum Propaganda' (was first under a different name before its official release). That same year, they signed to the American independent label 'Breath of Night Records' to release their album. That debut was basically the As Jerusalem Burns demo with 5 new tracks titled as As Jerusalem Burns... Al Intisar under the membership of Melechesh Ashmedi(guitar/vocals/bass),Moloch (guitar/bass/vocals) and Lord Curse (drums; later to leave the band to move to California). The following year, Melechesh performed several concerts in the holy land, not to mention the completion of a documentary film on the band, which was broadcasted several times to receive high ratings. In 1998 they relocated to France and Netherlands respectively, as a new demo CD was recorded. 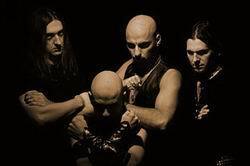 In 1999 the band's membership was augmented by Texan drummer Proscriptor (ex-Absu) to be finalized with Ashmedi (vocals/guitar), Moloch (guitar), Al'Hazred (bass/vocals) with keyboards handled by Al'Hazred, and the following year the members gathered in the Netherlands to record their sophomore album DJINN for 'Osmose'. It would be the follow-up album, Sphynx, which would secure their fate as a top-notch act in December 2002. With the members handing their own instruments plus keyboards handled by Al'Hazred and Ashmedi, other percussive work (Daf, Riqq, Darbukka) by Ashmedi and Moloch (with Moloch also handling Saz), and featuring guest musicians Niclas Rud olfsson on backing vocals for Apkallu Counsel track, and a guitar solo on Purifier Of The Stars tracks by Andy LaRocque (of King Diamond), the album was recorded at Los Angered Studios in Gothenburg, Sweden and engineered by none other than Andy Larocque (guitarist for King Diamond). The cover art was the work of Ron Woodall (Star Wars, Jurassic Park, Pearl Harbor movies) in San Francisco at George Lucas' ndustrial Light And Magic studios. 'Osmose' continued to release the album, with 'The End Records' handling it in North America. This album clearly demonstrated the act's unique black metal style dubbed "Mesopotamian Metal" ; featuring mid-east and Mediterranean influences the name was appropriate. The album even featured a full multimedia enhanced portion complete with full music video and description of their influences from the Mesopotamian/Sumerian eras of history. 2006 would mark the entrance of new drummer Xul (Thanatos) for the act's fourth album, Emissaries. DAFF: Frame drums are most ancient type of musical instruments. They can be found on wall drawings in ancient Mesopotamia. They have a simple structure with strong spiritual effect. The Daff has a round wooden frame, with a diameter of about 50 centimeters, and goatskin is pasted on the frame. This percussion is played in spiritual ceremonies through out the middle/near east, it is usually accompanied by heavy breathing technique that leads to a trance ("The Arrival Ritual"). RIQQ: The Riqq is a framed tambourine. Its membrane is about ten centimeters in diameter. The frame has five double openings, where there are ten metal discs placed symmetrically two at a time. The Riqq is held in the left hand and is beaten, in the centre of the skin, with the right hand. The membrane of a Riqq is made of fish skin. DARBUKKA: The hourglass-shaped Darbukka is a very popular percussion instrument used with Oriental music. It is introduced on "Apkallu Counsel" and "Incendium between Mirage and Time". The traditional Darkukka is made of clay with a head made of goatskin, yet there are models made of aluminum bodies with synthetic skins. The latter models are easier to tune with the aid of tuning screws; conversely, the goatskin usually require heating with an open fire or so, in order to tighten the skin for optimal sound. SAZ: The Sazis a long-necked Turkish lute with 10-19+ movable frets with a sound opening on the rear of the instrument. Strings are either steelor brass, and are plucked by a long flexible plastic plectrum. The sounds created by the Saz are metallic and buzzing. It is noteworthy to mention that on the pervious album "Djinn", we used a Buzuq. The Buzuq is from Saz family; however, it is more played in the near east, and is distinguishable by its sharper sound. As an additional note: Melechesh started their careers back in 1993 in Jerusalem/Bethlehem. Nevertheless, the members are not Israeli, but rather from various nationalities and started in these cities for the sake of geographic convenience .In 1998 they relocated to Europe. They prefer to be referred to as being from the "Assyrian Nation".